Friday begins one of the city’s largest sporting events of the year, the National Collegiate Women&apos;s Gymnastics Championship. 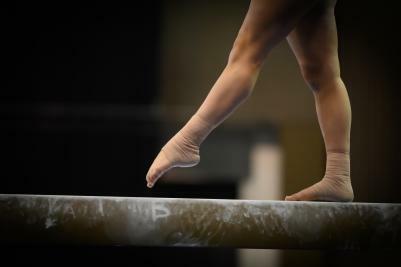 The two-day event at the Fort Worth Convention Center will determine NCAA Division I team and individual national champions in the sport of artistic gymnastics. ”The NCAA Championship is the most prestigious college meet of the year,” said Bryan Streeter of Metroplex Gymnastics & Swim. Its appeal extends beyond those who already count themselves as fans of artistic gymnastics." Friday’s competition is meaningful in two ways. It consists of a pair of sessions of four teams each. The top two finishers in each semi move on to Saturday’s final, billed as the “Four on the Floor.” In addition, top individual gymnasts whose schools did not qualify for Fort Worth will compete alongside the teams. Whomever records the best scores of the night, whether competing as part of a team or at-large will earn individual national titles in specific events or the all-around (combining scores from all events). Saturday, the four top squads will face off to determine the NCAA’s top unit. 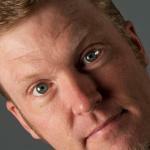 The team aspect adds another level of intensity. 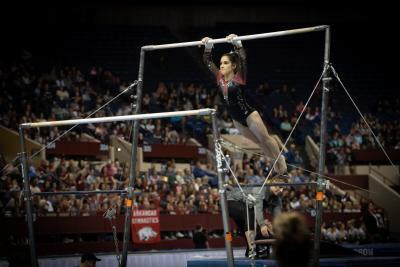 “Although it&apos;s an individual sport and one person may be up on the apparatus, the rest of the team is standing around them yelling, cheering them on,” said Horton. “They make it fun. They make it exciting. They&apos;re high- fiving, they&apos;re jumping up and down,” said Streeter about the competitors. So who might engage in this high-fiving and jumping (and competing)? Friday’s first semi, which starts at noon Central Daylight Time and airs on ESPN2, features UCLA, LSU, Utah and Michigan. All four rank in the top ten nationally. The second semifinal begins at 6 p.m. and will air on ESPNU, switching to ESPN 2 at 6:30 p.m. It features Oklahoma, Denver, Georgia, and Oregon State. Saturday’s round begins at 6 p.m. and ESPNU will broadcast the finale. Her Tigers have reached the Super Six (the final day of the championships consisted of six teams instead of four until this year) seven times in the last 10 years. They have finished as national runners-up twice in the last three years (including 2016 in Fort Worth). The number three-ranked Tigers will look for their first-ever team title this season with a roster that includes 2017 vault champion Kennedi Edney and 2017 bars titlist Sarah Finnegan. Utah boasts an amazing history in the sport, having won the first five NCAA titles starting in 1982, and a total of nine. They finished fifth last year. The Red Rocks have been to every NCAA championship meet. During the regular season, they won dual meets with Oregon State and Michigan and lost to UCLA and Georgia. No university has won more team (10) or individual (42) titles than Georgia. 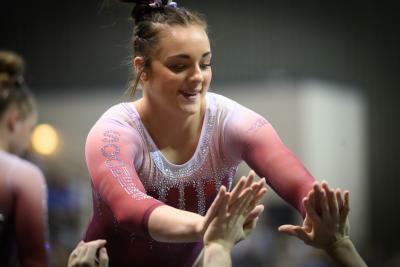 Sophomore Marissa Oakley posted a perfect 10 on the uneven parallel bars in the regional to power the GymDogs to a berth in the national competition. 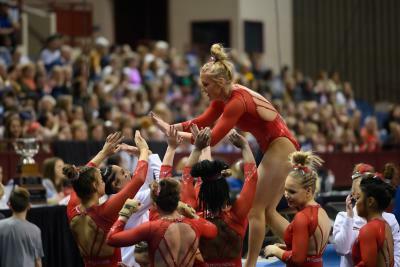 Fort Worth gymnastics fans got to see the University of Denver put up a score of 196.350 to finish second in the Metroplex Challenge nearly three months ago. The Pioneers bring a number five national ranking and a win in the Corvallis Regional into the championships. Michigan makes a 24th trip to the NCAA Championships in search of its first title. The Wolverines rank seventh nationally and have adopted the motto “Can’t Break Steel” as they’ve toughed out injuries (including to head coach Bev Plocki’s thumb) to advance to compete in Fort Worth. Oregon State comes in with the lowest national ranking of any of the eight schools at #15. The Beavers hit all 24 of their routines in the Corvallis Regional to prevent Florida, who won in Fort Worth in 2015, from returning to Cowtown.